Maddie's Fund today announced that Dr. Sheila D'Arpino will direct Maddie's® Animal Care Center, a model animal shelter and educational center slated to open next year in Pleasanton, CA. "We're delighted and thrilled to welcome Sheila to the Maddie's Fund organization. We're extremely fortunate to have her exceptional talent and skill to lead our new animal care center," said Maddie's Fund president Rich Avanzino. 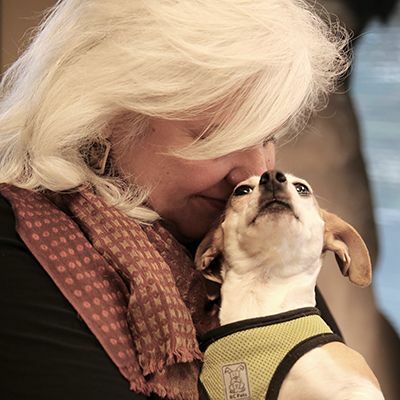 A veterinarian and board-certified veterinary behaviorist, Sheila has most recently worked at the Animal Rescue League of Boston where she developed and oversaw behavior programs for the Center for Shelter Dogs. Prior to her move to Boston, Sheila owned a veterinary behavior specialty practice and worked for the UC Davis Koret Shelter Medicine Program. In 2005, Sheila graduated from Maddie's® Shelter Medicine Program at UC Davis. She was the first in the nation to complete a three-year, post-graduate behavior specialty training program with an emphasis on shelter animals and shelter behavior programs. Sheila said she didn't imagine when she recently participated in brainstorming sessions for the new Center that she'd be tapped as its head. "I came out last year to consult on the project," she said. "It was an incredible opportunity to envision what, in an ideal world, a shelter environment should be. We were able to take a look into the future, and ask the big-picture questions we don't often have time for in this field." Admissions to Maddie's® Animal Care Center will be referrals of difficult-to-place shelter dogs and cats from animal control shelters. The atmosphere will be home-like, and the focus will be on creating best practices in shelter medicine, nutrition, housing and technology. Most importantly, each and every dog and cat will be treated as an individual family member rather than as part of a "herd," a major part of the Center's appeal to Sheila. "My vision is one of respecting every dog and cat as an individual, in all their imperfection," said Sheila. "After all, none of us is perfect, either. But just as we can respect and value one another's imperfections, we can respect the value of every individual animal life." Sheila will join Maddie's Fund on June 24, 2013. Maddie's® Center will open in 2014 and is located at 4280 Hacienda Drive, in Pleasanton, California, forty miles east of San Francisco.